Police deployed tear gas to dispel protesters, arresting dozens and injuring several people in Taiyun City, in China's Shanxi Province. The violent protests allegedly errupted over confiscated properties amid government corruption. Residents of Di Village in Taiyuan City say that Ma Jincai, the local Communist Party chief and head of their village, is corrupt, and although they often report problems to higher departments, authorities take no action to resolved any issues. According to the villagers, Ma expropriated their land with the promise of building houses for them. But after the buildings were completed Ma refused to give them to the villagers. Some residents were left without a place to live and had to rent or buy elsewhere, in addition to having lost their source of income because their farmland was also taken away. According to an online statement from one villager, a group of about 20 men from the village gathered in front of Ma’s property on the morning of May 26. A group of men with face masks and helmets soon arrived, proceeding to beat the protesters with clubs and forcing them away. Angered by this incident, villagers went to protest in front of the local police station. They brought banners that read “Return my land” and “We need the right of survival.” They also demanded that Ma explain what he did with the money he made from developing and selling their land. A village commissioner unsuccessfully attempted to negotiate with the villagers. Twenty minutes later, the chief and deputy chief of the Xiaodian District arrived with three anti-riot vehicles and hundreds of armed police. According to the villager’s statement online, the police had shields, clubs and tear gas. They started beating the unarmed residents with clubs and set off the tear gas. A witness at the scene said that there were about a thousand villagers and three to four hundred police. “The suppression ended in the afternoon around five o’clock. Nearly fifty people were arrested. Some of them were released. About five people were hospitalized,” the witness said. Local government blocked information about the incident. From what could be made out on the pictures posted by villagers on the Internet, the riot police had electric batons in their hands. The villagers said that Ma owns several expensive cars and that he opened a business with funds he acquired from the land expropriations. They said he now owns assets of nearly US$50 million. The villagers, however, are left without arable land to farm and have to work odd jobs to eek out a living. 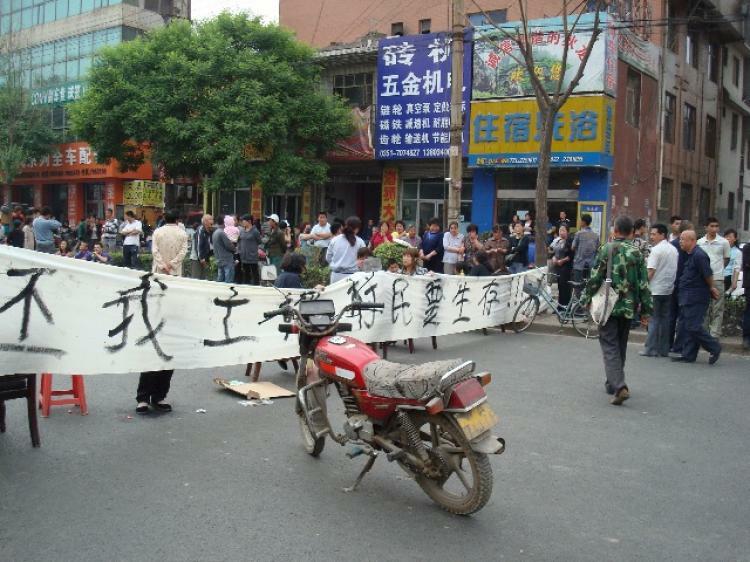 Forced relocations for the purpose of infrastructure or luxury developments are commonplace in China and have become a source of anger and unrest, especially because of the inadequate compensation generally given to landowners.